This review includes major spoilers for the film, please proceed with caution! Two years ago I wrote a piece for The F-Word about Suicide Squad and the serious misogynist crimes of that film. It feels somewhat cathartic now to write instead about a film that presents women in a very different way. The film in question is the charming yet challenging-to-pronounce The Guernsey Literary and Potato Peel Pie Society (2018) directed by Mike Newell. I am lucky enough to have seen it twice: once at the cinema back in May, not long after its release, and again more recently at my local arts centre. The second viewing was partly for the benefit of this review, but mainly due to the pleasure I derived from the first: on each occasion I enjoyed the film immensely, both as a story and as a bold expression of feminist characterisation and storytelling. The film tells the tale of London writer Juliet Ashton who travels to Guernsey to meet the eponymous group, formed as a way of defying the curfews of their Nazi wartime occupation. She subsequently learns the tragic story of how the society’s founder, Elizabeth McKenna, was killed in a concentration camp after falling in love and having a child with a German soldier. It closely follows a 2008 novel of the same title by Mary Ann Shaffer and Annie Barrows, herself a fan of the adaptation. The book is strictly speaking a work of fiction although researchers of the Channel Islands have revealed recently the amount of historical truth in both the story’s plot and its specific characters. The film has received its fair share of negative reviews arguing it’s overly cushty and indulgent. True, its ending when Juliet finds love with Dawsey Adams, one of the society’s members, is a little rushed and can be seen as detracting from the real-life horror of what has gone before it, as Elizabeth never returns. Among several standout performances there are a couple of glib ones, notably the rather wooden portrayal of Dawsey by Michiel Huisman. Finally, fans of geographical precision will be dismayed to learn that much of what is presented as Guernsey is actually Devon and Cornwall. A lot of this criticism seems ostentatious and dismissive, formed solely with a cynical audience in mind. Personally, I find the storyline heart warming and rewarding rather than twee or self-involved and stylistically the film is a delight. It is also depressingly unsurprising that so many reviews fail to address the film’s standout achievement: its feminism. Shaffer and Barrows have written a story that is driven by women, a powerful creative choice given it’s set in a time typically viewed through the masculine lens of wartime history. Although directed and adapted for screen by a trio of men, this feminist move translates into the film seamlessly, all the way to the cultured nod to the feminism of the Brontë sisters whose works are discussed. Most importantly, the film is carried by its charismatic women characters. Juliet, played by Lily James, is a successful and self-governing professional who refuses to be controlled by the men in her life, notably her editor Sidney Stark and her fiance Mark Reynolds. She defies their prohibitions to travel to Guernsey and upon her arrival on the island undergoes a journey of self-discovery and empowerment. Later in the film she has the confidence to leave the status and security of the wealthy but domineering Reynolds to pursue Dawsey instead, even proposing to him herself. While this does, to an extent, support the age-old patriarchal view of a woman needing a man, after dumping fiance number one Juliet prioritises her career and writing before pursuing fiance number two, which is presented as an independent decision rather than foolish, tunnel-visioned love chasing. Feminism, after all, opposes inequality, not romance. The two remaining female members of TGLAPPPS (a handy acronym, not an unpleasant disease) are equally pleasing from a feminist perspective. Katherine Parkinson and Penelope Wilton both shine in their respective roles as Isola Pribby and Amelia Maugery. Isola, my personal favourite, is an adept gin distiller and successful businesswoman. She can handle her potent juniper concoctions, too, so we are spared the traditional depiction of women who drink as emotional, promiscuous liabilities. Isola lives alone, secure and content in her own skin. As her friendship with Juliet grows, she admits that she longs to meet a male companion, but it’s clear that she craves love and romance rather than being defined through a relationship. Compelling as Isola, Parkinson is more than worthy of moving onto bigger film roles in the future. Amelia is a strong and determined woman who endured a considerable trauma, losing her husband, her biological daughter and her adopted daughter, Elizabeth, to the war. Wilton portrays Amelia perfectly, balancing dark and desperate moments with her resolute stoicism and fundamental warmth, giving the character a depth that is not always afforded to women over a certain age. Even above this trio, though, is Jessica Brown Findlay’s Elizabeth, the society’s founder killed by the Nazis after defying them in several ways. She is deported to the concentration camp for aiding a Nazi slave and is subsequently killed there after defending a fellow prisoner. Prior to that she is the one islander actively opposing the German soldiers upon their arrival on Guernsey. She is bold, fearless and radical. Making her a stand-alone hero of the war is refreshing given how typically these roles are reserved for men, with women remembered for their collective efforts on the home front. All four women are strong role models, brimming with confidence and self-esteem. They show clearly what many women have been in the past and provide an aspirational blueprint for what many more can go on to be. TGLAPPPS is a thoroughly enjoyable film to watch, which for some can be enough given how bleak the world can seem these days. Delve a little deeper and its true power is revealed, as a feminist tour de force glowing with inspirational women and offering a more equal consideration of a history typically viewed through a patriarchal frame. Most mainstream reviews will not tell you this, or will even go to remarkable ends to obscure it, like the Glamour interview with Lily James earlier this year. As the actor expresses her desire to deliver a strong feminist message with the film, somewhat incredibly Glamour’s editors see this as a green light to include a cropped photo of James with the article, creating the entirely unnecessary impression that she could be naked. Sterling work, well done all. The battle rages on, but the film is a big step in the right direction. The image taken from www.edgehill.ac.uk, not credited there, under fair use. 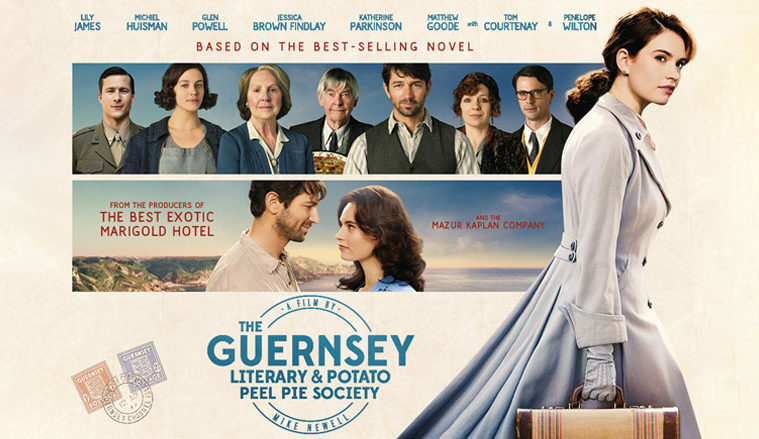 Film poster for The Guernsey Literary & Potato Peel Pie society, featuring small portraits of seven characters at the top and a bigger cutout of the lead, Lily James as Juliet Ashton, on the right. There’s lettering promoting the film.